NEW EXTENDED DEADLINE: MAY 1, 2017. PLEASE REVIEW THE NEW CANCELLATION POLICY DATES. In this course, participants will develop an understanding of the natural history, anatomy, ecology, and conservation of Neotropical reptiles and amphibians. We will additionally examine the roles of chemicals in herpetological studies, focusing on defense, food capture, aboriginal use, and modern pharmacology. Participants will also learn about the field of herpetology in general, exploring career options and implementing their own conservation and research proposals. As a bonus, one of the instructors is an experienced wildlife photographer, specializing in reptile and amphibian photography. He will be sharing a wealth of information on technique, field ethics, and safety – so bring your camera and your questions. We will have many opportunities for photo sessions, ensuring that you bring home the best possible images of this once-in-a-lifetime experience. This course will be held at the Los Amigos Biological Station, also known by its Spanish acronym EBLA (Estación Biológica Río Los Amigos). Situated between the Madre de Dios and Los Amigos Rivers on terra firme forest rising above the floodplain, this field station lies within the buffer zone of Manu National Park, which was recently declared the world’s top biodiversity hotspot, due in no small part to having the largest number of amphibian and reptile species on the planet. The Amazon is one of the most biodiverse places on the planet, home to several hundred species of reptiles and amphibians. In fact, nearly 20% of the world’s anurans can be found here. Walking through the forest at dawn or dusk offers a rich and colorful display of frogs, salamanders, snakes, lizards, and turtles, all of which fill an important environmental niche in relation to the other denizens of the forest. Unfortunately, due to climate change, disease, and other human impacts, many of these species are fast-disappearing. Understanding the challenges faced by amphibian and reptile conservationists in developing programs to protect these species is a crucial component of long-term protection of Amazonian biodiversity. The goal of this course is to give participants advanced training in field techniques relevant to tropical biology research and conservation, while also exposing them to one of the most diverse communities of plants and wildlife anywhere on the planet. This course emphasizes field exercises and learning over classroom-based lectures. Students will also read selected literature on tropical ecology, applied research, and conservation issues pertinent to the the Madre de Dios region and beyond. Each day, there will be early morning and late evening biodiversity hikes into the forest. Participants will gain practical proficiency in the correct identification of reptiles and amphibians, as well as recognition of microhabitats native to the area. Participants will learn and be expected to adhere to best practices in biosecurity and safety while examining reptiles and amphibians in the field. On each hike, we will also include a secondary focus for that day’s lecture and lab. These labs will highlight conservation of local herpetofauna, alongside the study of natural history. Program modules are designed to focus on local species and habitat, but can be easily applied towards herpetological conservation, research, and education anywhere in the world. Jennifer Stabile began her career as the reptile keeper at the Central Florida Zoo (CFZ), and soon developed a long-term partnership with Dr. Rafael Joglar at the University of Puerto Rico to preserve the island’s emblematic coquí through establishment of captive colonies, staff exchange programs, education and outreach. She also worked with the Florida Wildlife Commission Research Institute (FWCRI) on tracking emerging amphibian pathogens, and more recently she was Director of Conservation at the San Antonio Zoo where she helped develop their Research and Conservation Center. 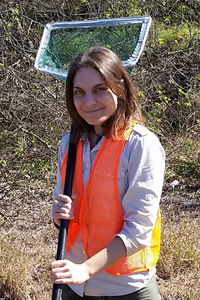 While there she also pursued research partnerships with the University of Texas and the Gladys Porter Zoo to assess the relative abundance of the Black-spotted Newt. In 2016, she accepted a role as editor of the conservation section of Herpetological Review, and has been elected to serve as president of the International Herpetological Symposium (IHS). Read her full bio here. Timothy D. Paine has thoroughly explored many diverse habitats throughout North and South America, from the Mojave desert to the Amazon rainforest, pursuing his lifelong interest in reptiles and amphibians. Having started his journey in the western U.S., his passion for herps has spanned more than 20 years and led him to participate in conservation and education projects, collaborate on surveys, and continually search for rare species in Costa Rica, Perú, Panama, Bolivia, Brazil, Ecuador, and Chile. 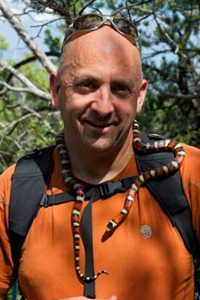 His herpetological expertise is well complemented by his dual interest in photography, and he has had images featured in gallery exhibits and educational settings, as well as published in small non-profit publications and esteemed scientific journals. Read his full bio here. The following background readings will be the subject of discussions during the course. We ask that everyone read these before arriving at the field site, since once there participants will be busy with field activities, and should primarily focus on experiencing the unique environment at the Los Amigos Biological Station. All of these will be provided to participants before the course begins, but you may also track them down on your own. Catenazzi, A. and R. von May. 2014. Conservation Status of Amphibians in Peru. Herpetological Monographs. 2014 28 (1), 1-23. Mendelson III JR, Altig R. 2016. Tadpoles, froglets, and conservation: A discussion of basic principles of rearing and release procedures. Amphibian & Reptile Conservation. 10(1): 20–27 (e116). This course will be held May 25th to June 7th, 2017. This means that you should plan to arrive in Puerto Maldonado, Peru, on May 25th, on any flight that day. We will arrange airport pickup for you that day. Your return flight should depart from Puerto Maldonado any time on June 7th. If you cancel on or before the registration deadline of May 1, 2017, we will refund all course fees paid in full (except for a registration fee of $100). Course fees cannot be refunded for cancellations made after May 5, 2017.